In brief: We are so happy to have found this place. The kind of hole in the wall that is essential in your lunch rotation. Our posting is a little erratic lately but even though we had this lunch last Friday, I couldn't not share it with you because it made us so very happy. We walked up a flight of stairs to an utterly unassuming place but where, against the far wall, an array of delicious options awaited. The $5.99 lunch special at Chandni Food was irresistible. 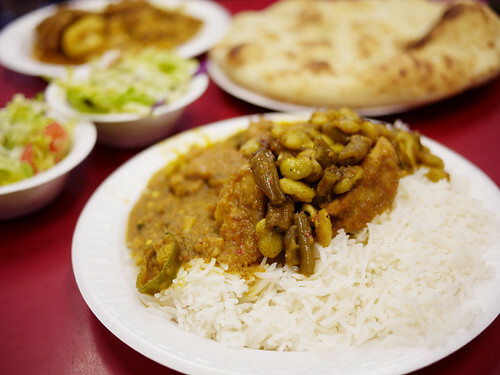 Considering that the deal consists of a plate full of chicken curry, vegetable of your choice, side salad and nan or rice, it will be difficult to chose anything else in the future. A helpful tip, go before the services at the mosque next door let out, otherwise there will be no tables left for you.